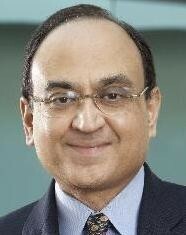 1981, BSc, Indian Institute of Technology; 1983, MBA, University of Chicago Graduate School of Business Administration. 1983-92, Partner, Booz Allen & Hamilton; 1992-98, various senior positions with PepsiCo, US and abroad, including Senior Vice-President and Chief Financial Officer: Pepsi Cola International; PepsiCo Restaurants International and Vice-President and Chief Financial Officer, Snack Ventures Europe. Since 2004, Vice-Chairman and Chief Financial Officer, Starwood Hotels & Resorts Worldwide.